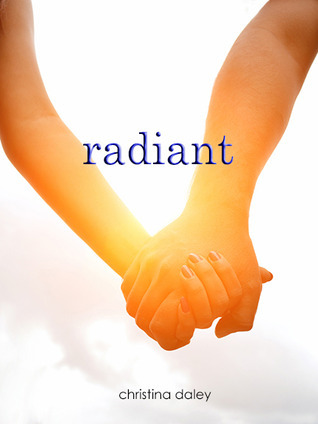 Hi everyone and welcome to the Book Blitz for Christina Daley's novel Radiant, organized by Xpresso Tours! Below you can find some more info as well as an excerpt. There's also an international giveaway for winner's choice of an ebook copy or a signed bookmark! "What about the kid the red car?" Mary asked. The doctor took off his glasses. "I'm sorry. He didn't make it." Mary stared at him. "But he looked at me." "I don't know if that's a good idea," Mom said. Mom's brow wrinkled. Then, she sighed. "We can see if his parents will allow it." The doctor released her, and Mary left the room with her mother. When they got to the end of the hall, they saw a homely couple speaking with one of the ER surgeons. The woman was crying, and the man clutched her as if he was keeping her from falling apart. "I'm very sorry Mr. and Mrs. Maxwell," the doctor said. "We're not the Maxwells," the man said. "I'm Marcos Romero, and this is my wife Linda. We're their housekeepers. Carter's father and stepmother are out of the country right now." "I see," the doctor said. "Have either of you contacted his parents? Or his mother?" "I called and left a message for Mr. Maxwell," Mr. Romero said. "Carter's mother past away several years ago from cancer." Mrs. Romero wailed. From the way she was crying, she might as well have been Carter's mom. Mary wished that she could cry with her. Mom once joked that Mary was born with the tiniest tear ducts in the world, so she didn't cry often. Now, she wished she could drum up a couple tears, if anything to not seem so unsympathetic. Mary looked at her mother, who nodded. Then, she cautiously approached them. "Excuse me. But I'm Mary. I'm the…what I mean is…." She couldn't find the right thing to say. Mary had always been terrible with words. Especially the sensitive ones needed for things like this. Mrs. Romero looked at her disheveled school uniform and her bandaged hands and knees. "You were the girl who was almost hit by the bus," she said. "Are you all right?" Mr. Romero asked. Mary nodded. "I am, thank you. But I was wondering if I could see him? Carter, I mean." "I would advise against that," the surgeon said. "The body…I mean Carter…is not—"
The stout couple looked at one another. At last, Mrs. Romero said, "Let her." The doctor looked at her. At last, he sighed and gestured for Mary to follow him. Mary was used to hospitals, ever since Mom became a nurse. But she had never seen an operating room occupied. Instruments and equipment were still in the places where the doctors and nurses had left them when they were trying to save Carter's life. At the center was the operating table with a still figure on it, covered with a bloody sheet. The doctor took part of the sheet. "Are you sure about this?" No, Mary thought. But she nodded nonetheless. He pulled the sheet down to Carter's neck. Mary stared at the broken, pale face of a boy she hardly knew. "I'll give you a few minutes." The doctor left the room to wait outside. Mary studied Carter's closed eyes. Maybe when they had opened in the car, it was because of an involuntary spasm. Or maybe she really had just imagined it. Mary bowed her head, once again wishing she could cry now. But all she could offer was a meager, "I'm sorry." Mary took one last look at Carter as she turned to leave. But she stopped. A single tear slowly fell from the corner of Carter's right eye. Mary rubbed her eyes, making sure her vision was clear. Then she looked again. Another tear escaped from the corner of Carter's eye. Mary bolted from the room. "He's crying!" Everyone looked at her like she was a lunatic. "Mary, calm down," Mom said. "But Mom, he's crying!" Mary repeated. "He has tears coming from his eyes." The doctor looked at her curiously. "Are you sure? Maybe the tears came from you?" Mary frowned. Couldn't he tell she wasn't crying? "You have to check him again," she said. The Romeros looked at the doctor, like they had seen a glimmer of hope struggling through the sorrow. He sighed and shrugged, but he turned and went back into the operating room. A tense few minutes passed. Suddenly, the doctor burst from the door, calling for his team. Several nurses rushed in and the door closed again. Mary and the others hardly breathed, let alone spoke, as they waited in the hall. Finally, after what felt like ages had passed, the doctor came out again, followed by the undeniable sound of the heart monitor beeping. What do you guys think of the cover, description, or excerpt? I am SO curious about what Carter is possessed by! A demon? Some other entity? Is the real boy still 'in there' somewhere?